Azerbaijani gymnast Samad Mammadli has qualified for the Youth Olympics, which will be held in October 2018 in Buenos Aires, Argentina. According to the results of the qualification competitions in artistic gymnastics, which were held on June 23 in Baku, Mammadli scored 77,931 points in the all-around and became one of 17 athletes who will compete at the Olympics in Buenos Aires. 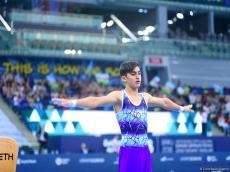 Another Azerbaijani gymnast Agamurad Gahramanov, who scored 74,032 points, came in 12th, but due to the fact that only one male gymnast and one female gymnast can qualify from each country, Gahramanov didn’t get a chance to take part in the competitions in Argentina. Samira Gahramanova, representing the country in competitions among female gymnasts, scored a total of 43.665 points, becoming the twenty-seventh, and could not get a chance to take part in the Olympics. In total, 52 young male and 44 female gymnasts from 32 countries took part in the qualification for the most prestigious tournament of the year.